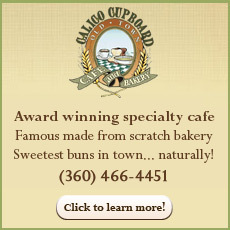 Julie developed new tourism websites and content marketing programs for Skagit County and La Conner, Washington along with more than a couple dozen other tourism and craft beer related businesses and organizations. She has contributed to Sparksheet and travel-related blogs. Julie splits her time between her homes in La Conner (on the Salish Sea and north of Seattle) and White Salmon WA (on the Columbia River and east of Portland) where she also has an airbnb. She takes a break from it all in the wilderness where she lets her creativity go wild. Welcome to La Conner and the 2019 Skagit Valley Tulip Festival! Surrounded by the Salish Sea and farmland filled with tulip and daffodil bulbs, our waterfront town is ready for your visit. La Conner’s boardwalk, waterfront hotels, farm-to-table restaurants, boutiques and museums make it the perfect Tulip Festival vacation home base! Get out your fishing poles and lace up your running shoes. The La Conner Rotary Club’s 54th annual Smelt Derby Family Festival and Smelt Run are coming up on Saturday, Feb. 23 with something for everyone. Tillinghast Postal and Business Center has moved down the street to 521 Morris Street at the 4-way stop. The new location allows for quick and easy parking along with plenty of space to serve your postal and business needs! La Conner Daffodil Festival March 2019 – 5th Annual! Win a La Conner Getaway! Take a selfie with our new ad at the Sea-Tac airport and enter to win! A winner will be drawn on Monday, April 8th. 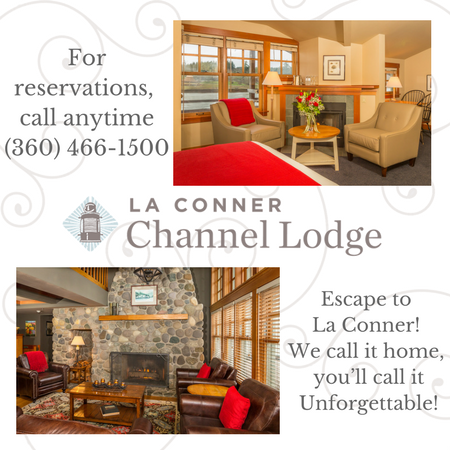 The prize is one night at the La Conner Channel Lodge, $50.00 gift card to Nell Thorn Restaurant, 2 – $25.00 gift cards to La Conner merchants (TBD), 2018 La Conner Daffodil Festival poster and more. Escape your To-Do-List at the Wild Iris Inn: Warm, romantic and intimate, the boutique inn offers a true retreat from modern life with luxury services and features such as a complimentary breakfast, free parking, charming guest rooms and famous cookie! Join us for the 2nd annual La Conner Birding Showcase during the Skagit Valley Birds of Winter Experience! Educational vendors and artists will be on display from 9:30am – 3pm. We are excited to announce our keynote speaker, Dr. Kaeli Swift. 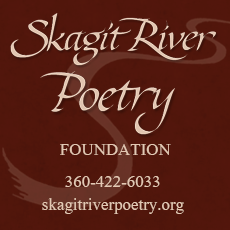 Skagit County Historical Museum Celebrating 50 Years of Excellence! The Skagit County Historical Museum serves as the official source for the understanding and enjoyment of Skagit County’s unique cultural history. In doing so, the Museum fosters community identity, understanding, and pride; offers a sense of belonging; and acts as a forum for bringing individuals and communities together. Sugar & Spice Makes La Conner So Nice – Holiday Happenings! Historic, waterfront, tiny, and charming are all ingredients of the sugar and spice holiday recipe for fun in La Conner Washington during the 2018 Holiday Season. Galleries, boutique and restaurants all join the fun of spicing it up for the Holiday Season! Don’t miss the window displays, art shows and special holiday menus! Art’s Alive 2018 – Celebrating 34 Years November 9-11! Maple Hall will be featuring 14 invitational artists in various mediums along with an Open Show with 60 local artists showing and selling. Live demonstrations by artist and live music performances will be at Maple Hall and throughout town in 15 different locations on Morris St. and First and Second St.
Jingle “Belles” is a Ladies Night of Shopping that will take place on November 16th, 4:30-7:30pm. This is your chance to get your girlfriends together, shop and be merry! Take advantage of special offers only for YOU. The 12th Annual La Conner Turkey Trot is a hometown run Thanksgiving morning in the beautiful waterfront town of La Conner, Washington. The La Conner Schools Booster Club hosts Turkey Trot with proceeds benefiting the La Conner Braves Track & Field Booster Club. The story of Earthenworks Gallery is a love story of sorts – starting with two Northwest-born teenagers who fell in love with art as they fell in love with each other. 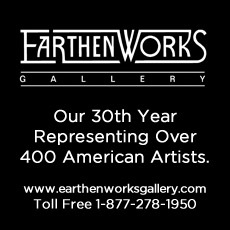 This is the story of Don and Cynthia Hoskins – who today own Earthenworks, one of the Northwest’s premier destination galleries in La Conner, Washington. 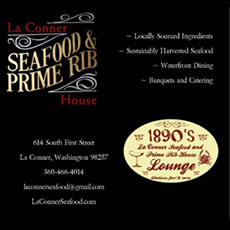 La Conner is the kind of water-front town where you can walk from the old-time tavern to the cool restaurant featuring live music to top reviewed foodie spots and then to our very own brewery all in two blocks. What better place for a beer festival! The 4th Annual Brew on the Slough is scheduled for October 20th, 2018. Get to Know Katy’s Inn! Meet the owner of Katy’s Inn! Kimberly Good Rubenstein is a 5th generation Skagitonian. Born and raised in Skagit County, she graduated from La Conner High School and Washington State University earning a degree in Hotel and Restaurant management. 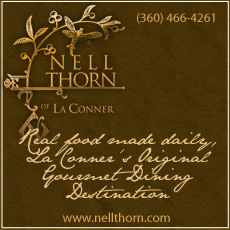 Today, Nell Thorn is undeniably one of the best restaurants north of Seattle or south of Vancouver, B.C. With fresh ingredients and a truly Northwest-inspired menu, Casey, Susan and their staff love finding new ways to bring foods and flavors together. They also love making sure that their customers have a terrific experience. Beginning July 25th, the Swinomish Indian Tribal Community will host The Tribal Canoe Journey (TCJ). Swinomish will welcome over 100 family canoes, mostly from the Northwest, but also from as far away as Hawaii and New Zealand to the shores of its Reservation. The La Conner Classic Boat and Car Show presents an opportunity to share our American heritage with you and your family August 3rd – 4th, 2018. Whether your love is classic cars, show cars, classic yachts, or work boats, you’ll be surprised and delighted at this event. 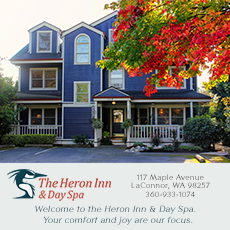 Whether you’re planning a romantic getaway, family outing, organizational retreat or a commune with nature, as a guest at The Heron Inn & Day Spa, their inn is your inn. 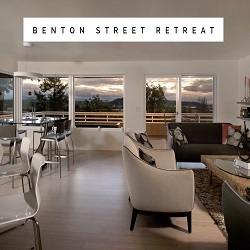 Visit and stay at The Heron Inn in La Conner, Washington and then — relax! They will take care of you. Today I had the opportunity to ride along with Dave Hedlin, third generation farmer, of Hedlin’s Family Farm in La Conner, WA. Hedlin’s Family Farm is located less than 10 miles from Skagit Valley Malting where the barley will be malted when harvested in late August. Join us on Thursday June 14th from 5-7 to support the beautiful hanging flower baskets! The La Conner Marina is a premier destination for recreational boaters, commercial fishers and marine-related businesses and manufacturers. Located within easy walking distance of charming downtown La Conner, the marina is a clean, service-oriented facility that tourists and La Conner residents alike enjoy visiting. 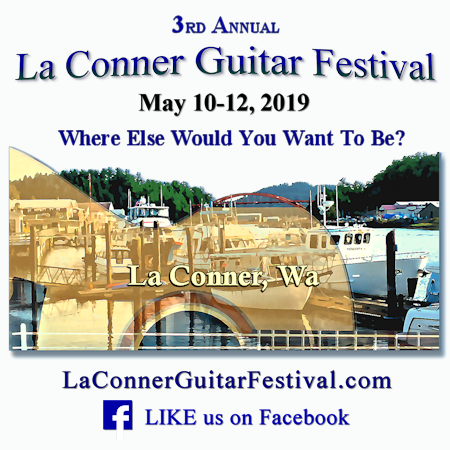 Come to La Conner for the La Conner Guitar Festival May 11th – 13th. It’s your opportunity to find the instrument of your dreams! Thank you to everyone who voted! Between Facebook and Instagram we had more than 2,200 votes. Both are just steps from shops, art galleries, museums and dining and between the two offer pet-friendly rooms, wine tasting, musical entertainment and a wide variety of package options. With dark, cozy winters behind us comes the promise of spring and cheerful backdrops in La Conner and the Skagit Valley. Here in this beautiful area, you’ll find fields of gold and rainbows of color. Typically the first question that arises when someone mentions a Tweed Ride is what is it and what does it mean? The short answer is that a Tweed Ride is a throwback to days-gone-by in England where family members would dress in their very best clothing for an outing. 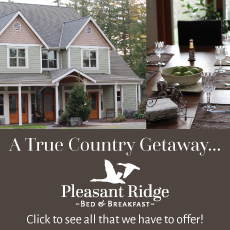 The Pleasant Ridge Bed & Breakfast is a special place and just a stone’s throw away from friendly La Conner, Washington. Looking for a renewing day-trip or overnight excursion? 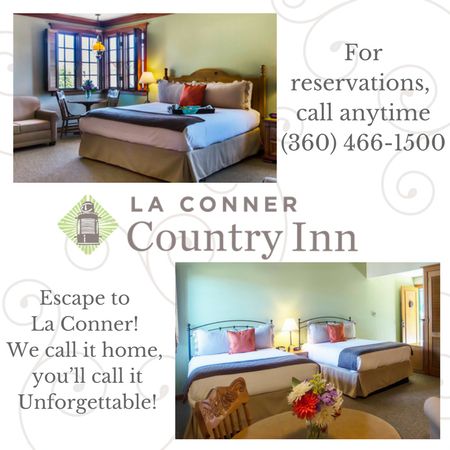 La Conner is just the ticket for a getaway! We have lots of fun things to do and see – whether you’re in need of a romantic cozy fireplace and a warm drink, a little shopping, or a walk along our boardwalk inthe fresh/crisp air, we’re just the place. By buying the La Conner Weekly News last June, Ken Stern continues the legacy of a weekly newspaper being published continuously in La Conner since 1873. The holidays are truly a wonderful time of the year. This is especially the case when talking about La Conner and all that it has to offer. Explore our list of holiday events for the month of December! The La Conner Tillinghast Postal and Business Center offers incredible levels of convenience for those who live and work in the local area. No need to travel long distances in search of business related services. Heron Day Spa embraces a nurturing philosophy embodied by a menu of massages, and facials that promote your health and well-being. 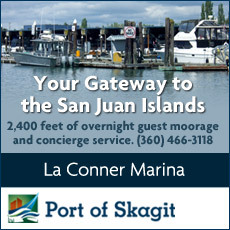 Breathtaking views of the Padilla Bay, Swinomish Channel, San Juan Islands, and Mount Baker along with local artwork, luxury bedding, stylish hotel room furnishings and glass-enclosed showers will ensure your comfort and a pleasurable resort hotel stay while visiting La Conner. MoNA celebrates the life and work of Clayton James (1918 – 2016), with an exhibition of art and photographs from the permanent collection and selections from archives recently donated to the museum. THANK YOU to our Flower Basket Sponsors! The annual tradition of lining First & Morris Streets with beautiful flower baskets has begun! Listed are the wonderful individuals and merchants that sponsored the 2015 La Conner town baskets. 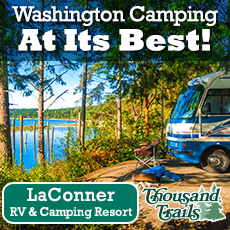 The Best Northwest Escapes 2014 – Vote La Conner!